Rajinikanth Film Review From Padaiyappa. Padaiyappa Movie. 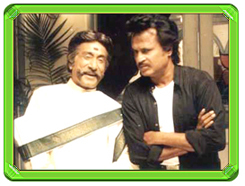 Rajini Film Padaiyappa. Rajinikanth Padaiyappa movie. www.rajinikanth.com. Lakshmis brother is Radha Ravi. Naasar is his son and Nilambari (Ramya Krishnan) is his foreign-educated, arrogant daughter. Vasunthira (Soundarya) is a servant maid in Nilambaris house. Nilambari falls in love with Padaiyappa for his Five good qualities (one of the questions in next years Fifth standard final exam would be What are the Five qualities of Padaiyappa for which Nilambari falls in love with him ?!). But, Padaiyappa falls in love with Vasanthira. Padaiyappa overcomes all the hurdles and tricks of Nilambari and marries Vasanthira. So, it is just another Triangular Love story right ?! Well, it would have been, if the movie stopped here. Nilambari keeps her disappointment and vengeance deep in her heart. Time flies by and Padaiyappa is old now and he has two daughters (Preetha and Anita). Nilambari tries to take revenge on Padaiyappa and his family after 18 years, using Padaiyappa's daughter Preetha Vijaykumar. How will Padaiyappa handle this ? Will Nilambari win her battle ? - forms the rest of the story. Rajnikanths acting is very good. He portrays enthusiasm in the younger role and seriousness and maturity in the older role. His comedy is enjoyable. He does a new style of throwing a shawl, and a new Rajni Salute ! (he does a variation of his good old cigarette style - in this movie, he does it with a cigar !). Super Star looks Super Slim ! (looks like he lost some weight - he looks thinner than everybody else in the movie). The makeup for Rajni could have been better - in some scenes, the wig (toupe) is obvious and for the older Rajni, the beard is not so natural (the olders Rajnis make up is similar to his makeup in the movie Batcha). Rajnis punch dialogue in this movie is "My way is unique way'' !